Great news, there is currently a Superdrug student discount to get 10% off, but this is for in-store purchases only. To get it, go to this special page on superdrug.com, follow the instructions and you’ll be issued with a special promo code to use at the till. Also don’t forget to check out the Superdrug offers page with up to 50% off a large selection of fragrances, beauty and gift sets. The second largest health and beauty chain in the UK (we won’t name the first, but we’re sure you can), Superdrug is considered the younger, fresher and more beauty-oriented cousin of its competitors. You won’t struggle to find a branch either, with over 800 stores across the UK and Ireland, a well-stocked website and various health services available. We know that the results can be confusing on Google, we’re here to make things clear with this comprehensive Superdrug student discount guide. Is there a Superdrug Unidays, NUS Extra or Student Beans Discount? Sign up to the Health & Beauty card. You need to present this to qualify. Next, go to this special page on superdrug.com and validate your student status. You can do this either through Unidays or NUS Extra. When you’re in a store, present the Health & Beauty card and your student id. You’ll get a fantastic 10% reduction. Even though there is a Superdug student discount it is for in-store only. That got us thinking are there other ways to make savings at this beauty and pharma giant. We did some research into this and we’re happy to bring you the results that could end up saving you uni goers a packet. If you’re not looking for a particular brand that it’s a great way to start. This fine company release promo and voucher codes throughout the year that anybody can use on the website. Typical savings have included discounts on sections such as fragrances of up to 20%, free delivery and a fixed amount off a minimum spend such as £5 off spends over £50. This is regularly updated with some of the best offers, sales and deals that Superdrug offer. There are 2 main reasons why you should get the Superdrug loyalty card, which is called the ‘Health & Beautycard’. The first is that you earn points which means discounts for students when buying in the future. The second is that you need it to get your you in-store Superdrug student discount. The best offers of the week are on the Star Buys page. When we had a look they had some products better than half price. They also included some great brands including L’Oreal, Oral B and Boss. Then sign up to Dare magazine, the official store publication. They come with vouchers you can use in-store and online plus some great articles and beauty tips. If you are ordering online then it is pretty easy for students to get free delivery and there are several options with low order values to qualify which we really like. Next day delivery to your student digs is £5.50. Expensive but perfect if you’re at lectures or planning to spend the day watching Judge Judy repeats! If you’re looking to buy a big item at Superdrug like some expensive fragrances it might be worth holding on if there is a big sale coming up. 3. Is there a UNiDAYS Superdrug, NUS or Student Beans Discount? There are now 3 big student discount schemes in the UK: NUS Extra, UNiDAYS and Student Beans. We often get asked a lot whether there is a Superdrug student discount through these schemes so we’ve done some extensive researching so we can answer your questions properly! The great news is that there is a Superdrug UNiDAYS student discount. It entitles you to 10% but in-store only. To get it you need go to this page on superdrug.com and follow the instructions. We also show you the step by step way to do it in our first chapter. If you’re looking for discounts online, make sure you check out our 8 ways to save chapter above too which has lots of great advice. NUS Extra card members also qualify for the in-store reduction for students. But again you need to have a Health & Beauty card to qualify. It’s good to get though as it’s free and you get extra benefits too. Nope, there is no association between Student Beans and Superdrug. This would make things easier for students, but you can still get the 10% reduction as mentioned above. Here’s a summary of the best offers, see them all in our savings section. You probably have a Superdrug on a high street near you either at uni or at home (there’s over 900 in the UK alone), but if you don’t, don’t despair – there’s plenty stocked online in their e-commerce store too, including some items you may not want to purchase face-to-face with a member of staff. Besides the standard health and beauty range you’d expect to find in-store, you’ll also find pharmacies and medicines, beautician services, dermatology consultancy, perfume ranges, gift stores, and even nurse clinics. As Superdrug grows, there’s more and more on offer: so keep checking back online or in-store for more developments. If you’re a vegan, or just conscientious shopper, there’s no doubt that Superdrug is the beauty destination for you. Awarded the BUAV cruelty-free bunny logo all the way back in 2010, all of its own brand products are manufactured free from any animal involvement and testing. In 2018, the firm opened a vegan-only store in Shoreditch’s Boxpark mall known as ‘The Little Vegan Pop-Up Shop’, showcasing its vegan and cruelty-free products and offering exclusive store-only items that are guilt-free purchases. Navigating your way through cruelty-free stamps, parent companies and their associated supply chains can be a difficult business – so with Superdrug you know you’re sorted, without the hassle. It makes it the ideal place to buy gifts for your vegan or eco-conscious pals, too! Much like its main competitor Boots, Superdrug offers a loyalty card to collect points when you buy online or in-store. The Health and Beauty Card fits nicely in your purse and wallet and has a handy mirror printed on… so you can re-apply and check up on your Superdrug products even when you’re out and about. 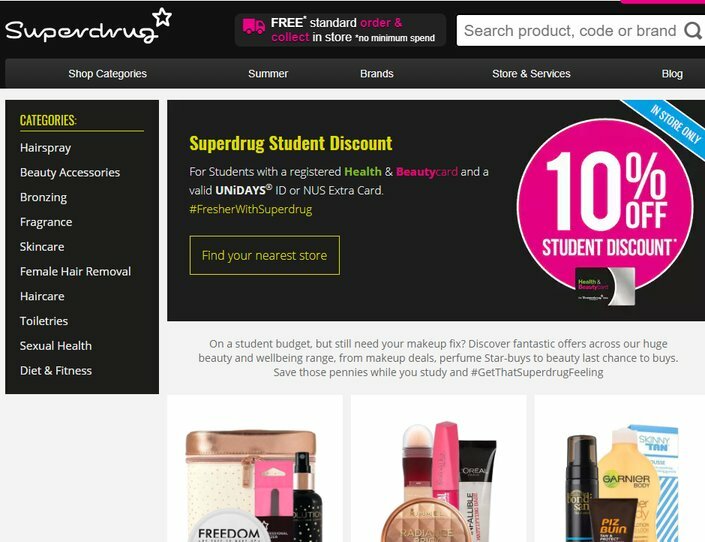 Superdrug are often marginally cheaper than their high street competitors and also offer a 10% student discount as standard through UniDAYS – but as ever, keep an eye on Student Discount Squirrel to keep up with the latest offers, discounts, voucher codes and sales. Don’t buy anything until you’ve checked back here first! Superdrug was first incorporated in 1964, and its first shop opened two years later. Originally, the stores were grocery-focused, as the founders, the Goldstein brothers, had experience working in the supermarket sector. However as the chain grew, a 49% stake was acquired by a US chemist chain, The Rite Aid Group, and the focus began to switch to a core health and beauty range; not dissimilar to the one we know and love today. By 1981, there were over 300 Superdrug shops in the UK and the company opened its first distribution centre. It continued to grow by acquiring smaller chemist and beauty chains and absorbing them, and was sold on several times before becoming part of the AS Group, who also own discount health and beauty chain Savers, in 2002. Now, Superdrug is widely respected as a high street staple and are considered somewhat more easily glamorous and accessible than its main competitors, focusing on lower-cost products rather than high-end brands and electronics. Diversification has allowed the chain to offer in-store services such as eyebrow threading, make-up artistry, dermatology consultations and nurse clinics; a range unrivalled by others on the high street. Its website has gained attention for it’s ‘test and send’ health screening services allowing a discreet private testing facility many are unable to access through the NHS. It is also recognised for its vast range of own-brand products, which are not only cruelty-free and primarily vegan, but often offer cut-price versions of much more expensive high-street items. If you’re looking for more great offers then make sure you check out Student Discount Squirrel. It has over 900 stores and employees 14k people! The first stores opened in Putney London in 1966! In 2013 Superdrug went into venture with Premium Skin Care. It has it’s own magazine called Dare. Boots – the top health retailer in the UK we a great loyalty rewards card, plus great meal deals! The Body Shop Student Discounts – lovely smelly stuff at great prices, plus lots of discounts to boot! Check them out today. Looking for make-up, fragrances and cosmetics check out Cult Beauty! Looking for supplements, food and general healthy stuff? We love Holland and Barrett! A new kid on the block – Feel Unique discounts are always worth checking out.